Any time you plan to rent a booth at a tradeshow or if you are hosting a presentation during a conference, preparing ahead of time can ensure that you are likely to succeed at being remembered. At your next tradeshow, implementing a few no-fail tactics can ensure your presence is a success and that you are well-received by other networking professionals and potential customers whom you are targeting. Creating a unique and colorful display is highly recommended at any tradeshow you attend. Using high-quality graphics, images and photographs that are representative of your business will help your brand to stand out. Branding your presentations at any tradeshow is a great way to increase visibility while boosting your reputation professionally in any industry. Be sure to include the same color scheme and logo on all printed and hanging materials featured at your tradeshow booth or display. Giving away promotional products to tradeshow attendees is the most effective way to ensure that you are getting the most exposure possible at the next tradeshow you choose to attend. Whether you want to give company logo bags or if you are interested in other items such as stationery, pens, notebooks and even coffee mugs imprinted with your company’s logo and contact details, there are plenty of options available. Ideal promotional products to give to tradeshow attendees include custom promotional bags because they will be used to carry around everything they get at the show, but you might also opt for pens, screen cleaners and USB chargers imprinted with your logo. Remember to keep in mind your target audience and try to appeal to their needs. What will they use in their everyday lives? Focus on this question when choosing which promotional products you will use at your next tradeshow. Be sure to send a clear message that relates to your brand and the products or services you provide. Giving away pamphlets or designing banners and note cards that represent your business within a tradeshow booth can help to quickly inform passersby of your brand. 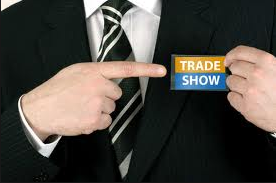 Networking as much as possible at a tradeshow event helps you to build a name professionally while increasing your chances of finding investors or potential business partners for the future. Knowing how to implement a few no-fail tactics at your next tradeshow can ultimately mean the difference between making a splash in the industry you represent or being forgotten. Staying up-to-date and current with the latest marketplace trends and the type of marketing that works best for your business can result in truly making a positive impression at any tradeshow or conference in which you participate. I think that on many occasions the quality of the displays used at trade shows is overlooked and specifically the design. We produce portable exhibition stands for events and frequently we have to help customers with the supply of something professional to help present a good image.